My winter/errand bike has been a well used 1987 Panasonic MC 7500. 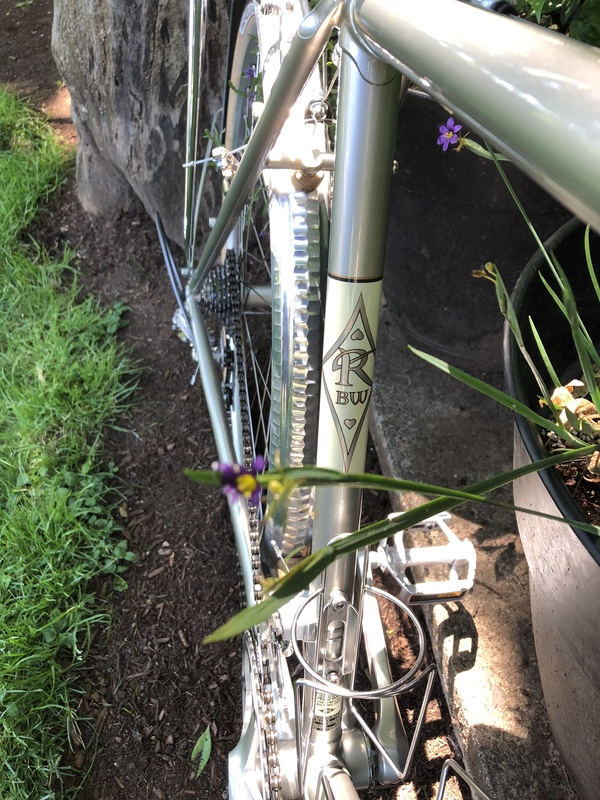 I bought that bike as a frame and fork many years ago, and then built it into a Portland workhorse. 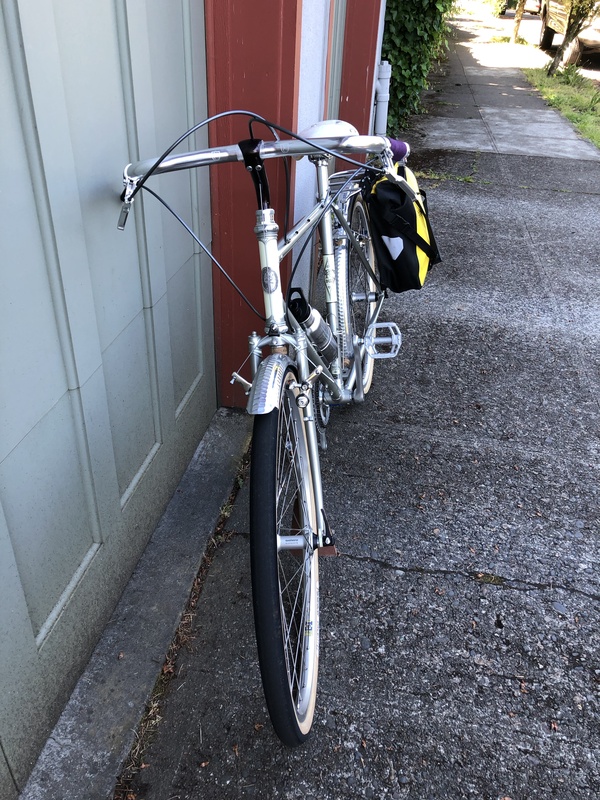 Rigid lugged steel vintage “mountain bikes” serve as excellent platforms for conversion to a sturdy errand/winter/commuter bike. 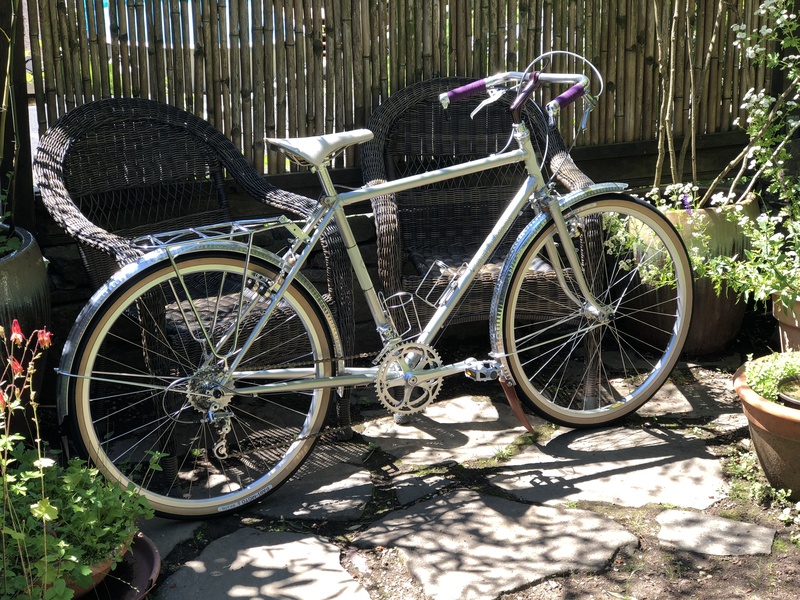 The Bridgestone MB3 frame sat in my shop for a few months, as I had purchased it only for its lavender Nitto stem to use on my newly built up Rivendell Appaloosa. Well, sort of but not really. The Bridgestone frame was in great shape, and it kept staring at me every time I loaded another bike into the work stand. Finally, I gave in, transferring many of the Panasonic components, which I disassembled, over to the MB3. The build was pretty straightforward, and would have been completed much sooner had I not decided to use Suntour cantilevers, whose set up required more time. Finally, the bike was ready for a few assignments. 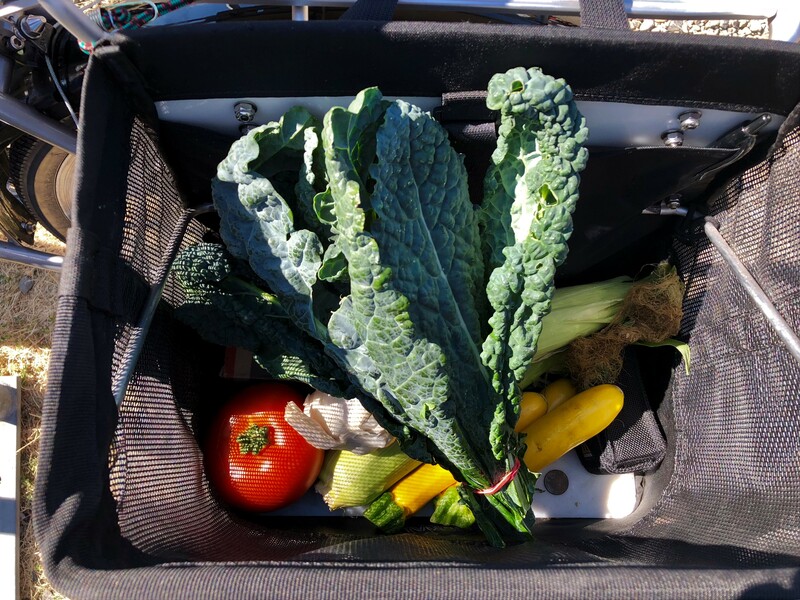 Veggies loaded into my Jandd grocery pannier. 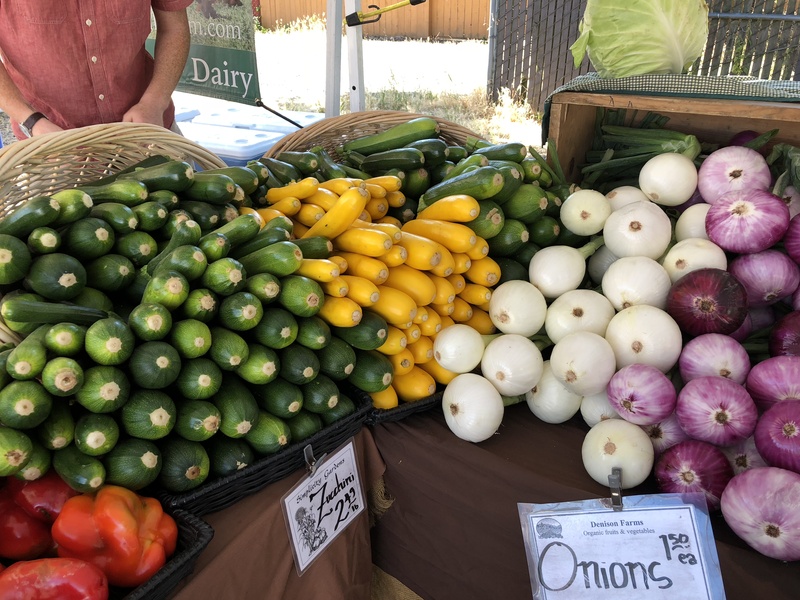 First, I headed over to the Montavilla Farmers Market. 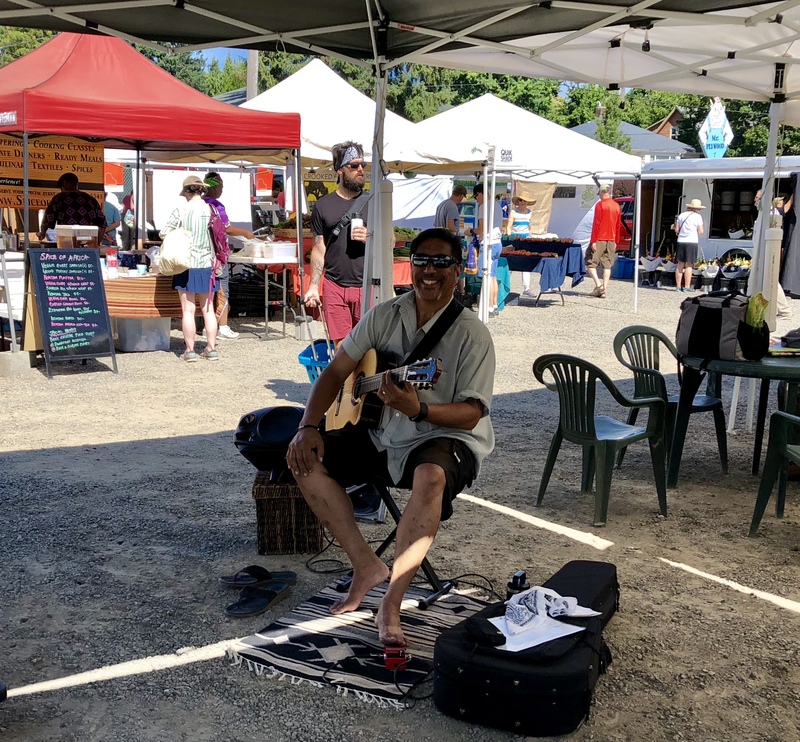 This weekly Sunday event features an extravaganza of luscious fruits and veggies, homemade honey, jams and jellies, along with flower bouquets, wines, breads and baked goods, and some mellow classical guitar to accompany your shopping experience. After dropping the veggies off at my house to stay cool on this hot day, I pedaled over Mt. Tabor and headed down to my local Powell’s bookstore on Hawthorne. While there, I discovered this 2013 reprint of a 1901 cycling manual by Isabel Marks. Major score! The book contains instructions and photos on how to do some “fancy cycling” by performing tricks on your bike. 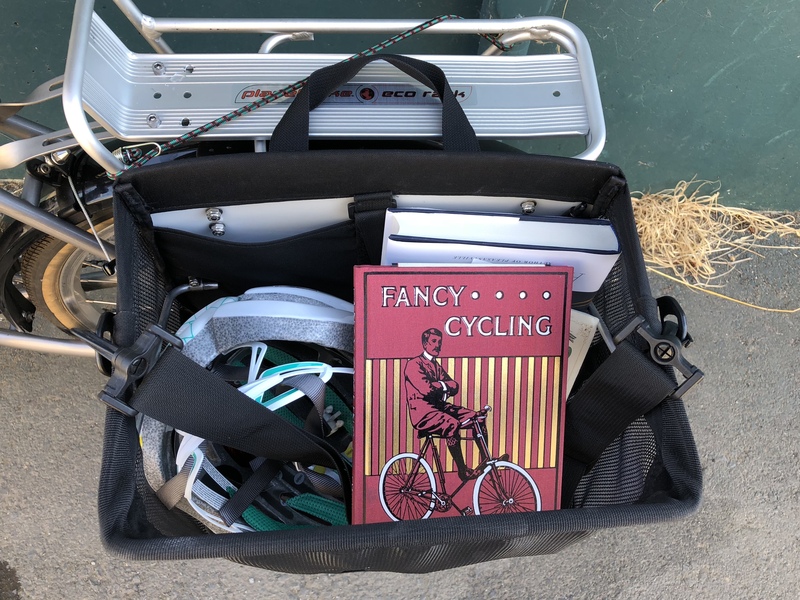 It looks like I have lots of work to do, as my track stands are not done while seated backwards in the saddle, one of the many tricks illustrated in the book, with period photos as illustrations of each maneuver (more on this book in a subsequent post). Suntour XC low profile cantilevers. 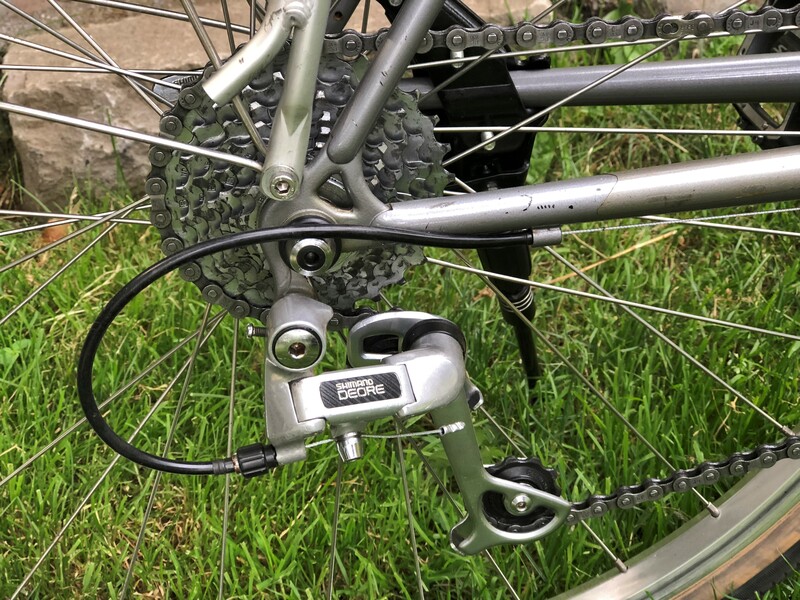 I re-used the original Shimano Deore derailleurs and the 12-28 Shimano 7 speed cassette. I discarded the Biopace crankset, and replaced it with this modified Stronglight 99 with drilled rings. The crankset was originally a triple 52/42/32, but I removed the big ring and converted it to a double 42/32. I used the original Deore bottom bracket and front derailleur, and it somehow all worked out well. Original Ritchey Vantage wheels on Shimano Deore hubs. The wheels needed re-tensioning and truing, and the hubs were rebuilt and now spin smoothly. Northroad bars with Suntour levers and shifters. 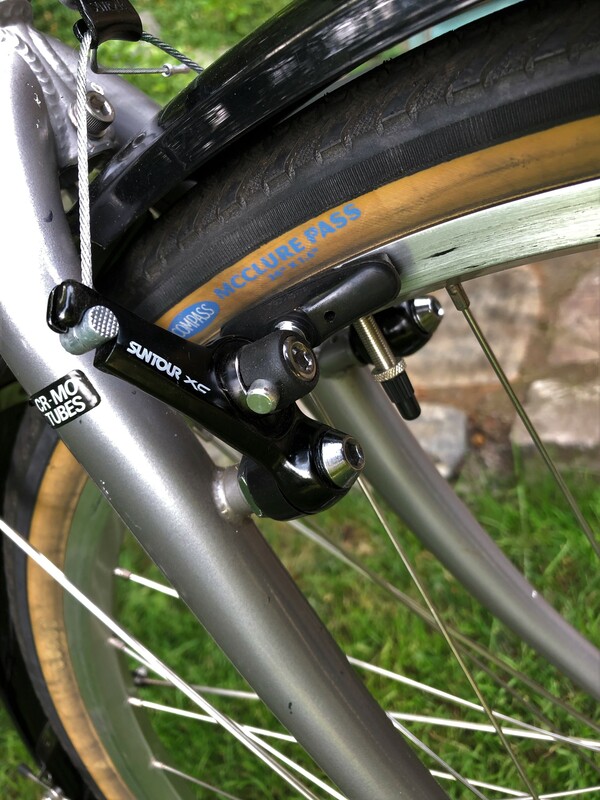 The Suntour levers offer easily adjustable brake reach – a nice feature for riders with smaller hands. A Cardiff leather saddle is shown in the background. While I’m not sure yet whether I will replace my Panasonic MC 7500 with this bike, I have enjoyed my experience so far. The bike received some nice comments today from passersby. 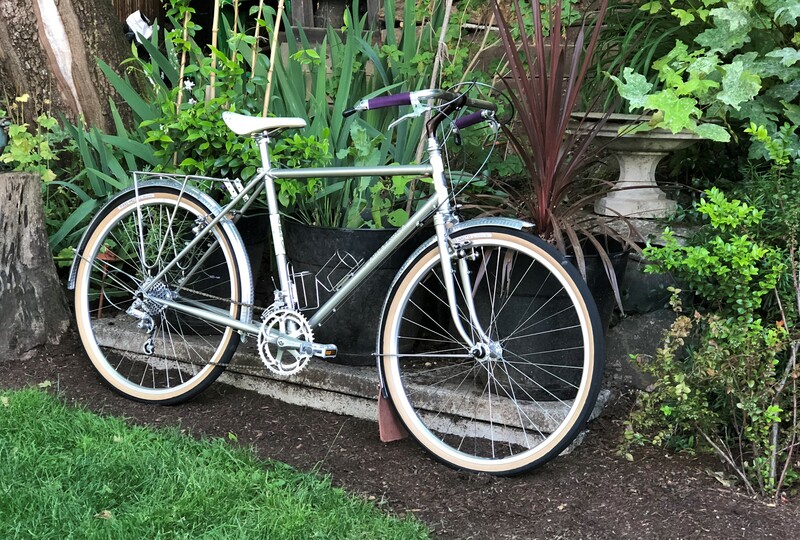 It’s a good looking bike, and as configured performs just as I would expect from a quality steel frame and excellent vintage components. I first became aware of Rivendell back in 1999. 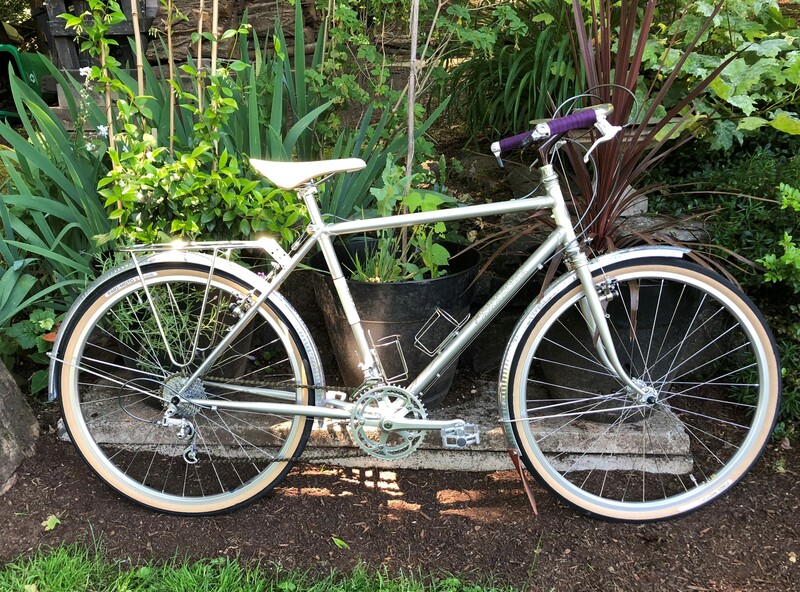 At that time, I was looking to replace my crashed 1976 Centurion Pro Tour, a bike which was my only bike for 20 plus years, and upon which I had ridden over 40,000 miles. I didn’t know how difficult my quest would be, and maybe that’s a good thing. That quest led me to question all that the cycling industry offered during those dark times: racing bikes marketed to everyday riders with no clearance for decent width tires and fenders, mass produced aluminum frames, carbon forks of questionable reliability, and throw away parts. Then, along came Grant Peterson, guru of “normal cycling”. Back then, there wasn’t a web to browse, so mail order catalogs were how you learned about the latest stuff. I wish I had saved those old Rivendell Readers, but at the time, who knew? I now only have one or two in my collection of print material. While I have many great bikes that I enjoy riding, as I’ve gotten older I’ve noticed that I prefer being in a more upright position. 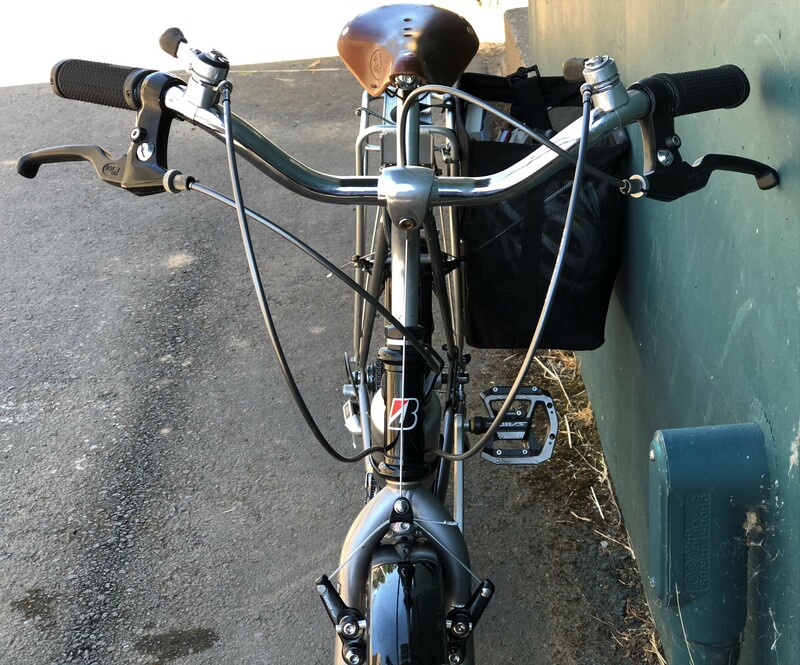 Much of my cycling is commuting, and being more upright is not only safer, but a bit more comfortable. 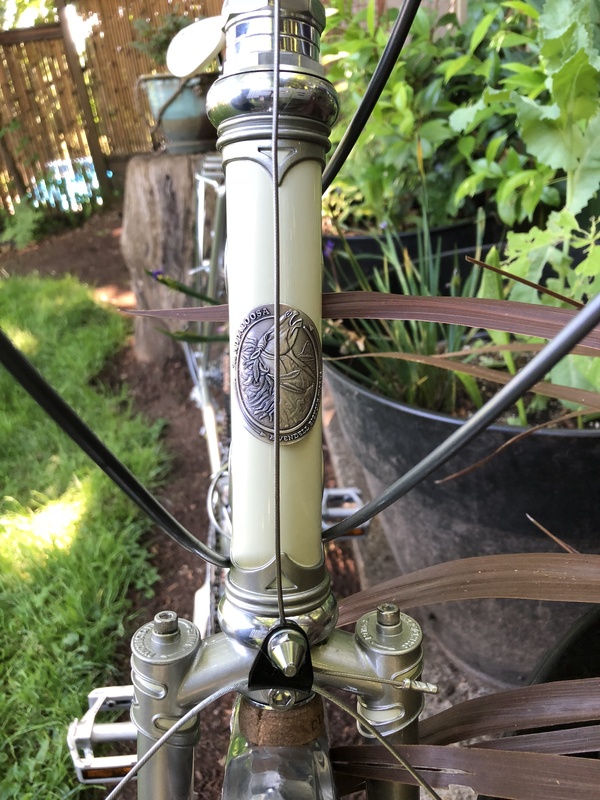 While any bike can be converted to a more upright position, many Rivendell frames are dialed in that way. The Appaloosa features a 112 cm wheelbase (exclamation point! ), clearance for 55 mm tires (another exclamation point! ), and is made with lugged, butted cro-mo steel. The lugs, and almost every other feature of this frame, are well executed. I can’t think of any other non-custom frame that is as lovely. It is almost too beautiful. 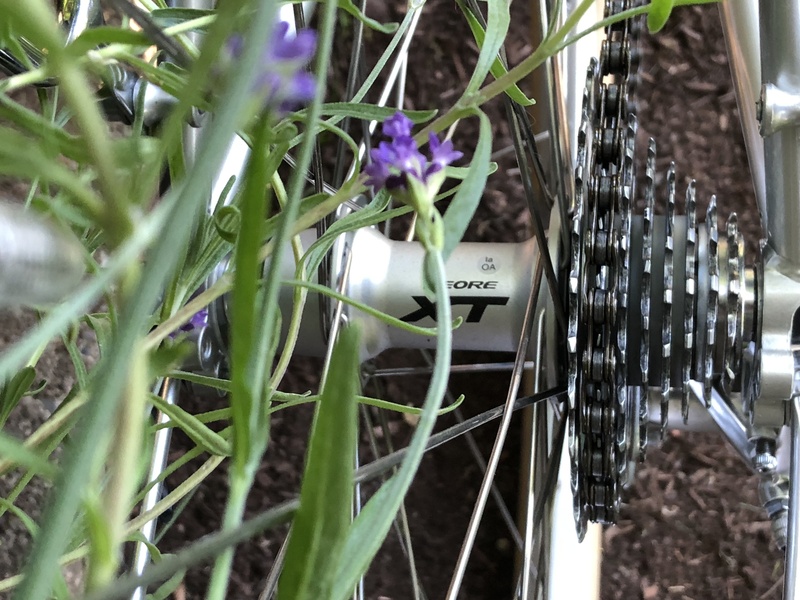 For the drive train, I wanted to use my favorite vintage Japanese component maker: SunTour. 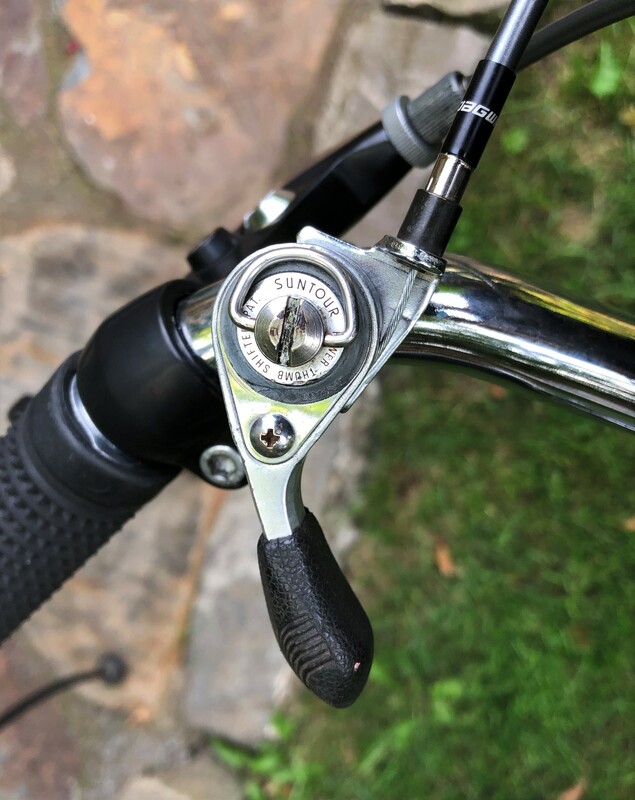 If you haven’t used their friction ratcheting bar end shifters, you are missing out. 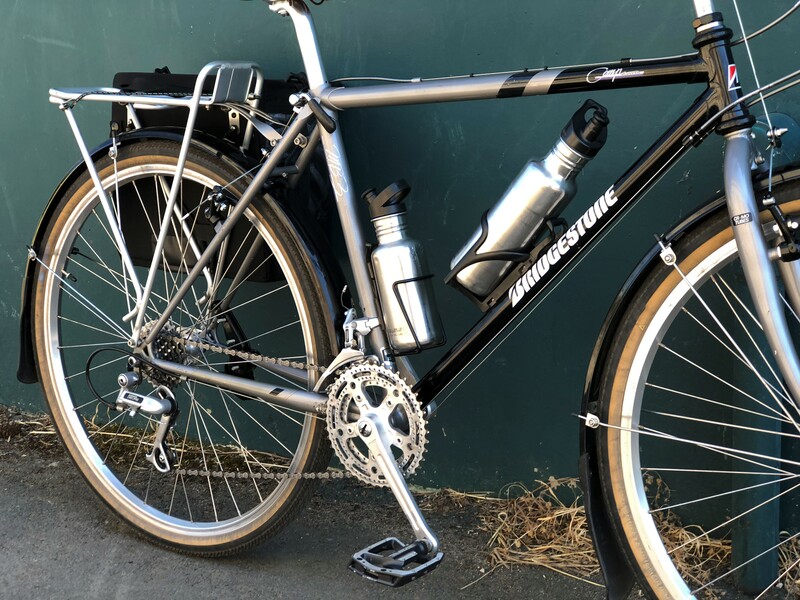 For this build I chose a SunTour Superbe front derailleur, a SunTour Sprint cankset and bottom bracket, and a SunTour Cyclone rear derailleur. You might wonder how these vintage components worked on this new frame. Perfectly! 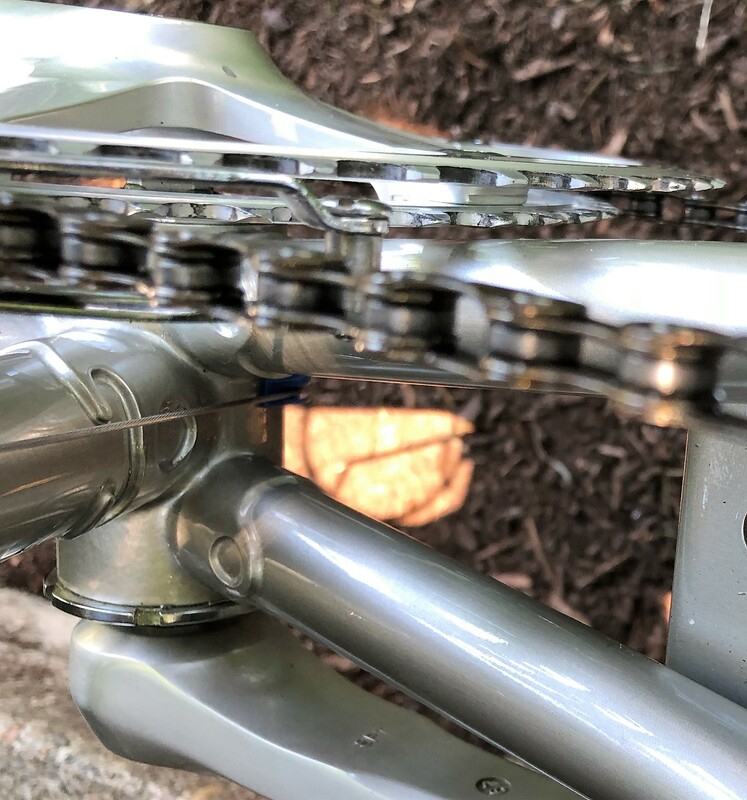 I was worried that the Cyclone wouldn’t be able to handle the 8 speed cassette, but with the adjuster screws dialed all the way out, it was able to swing across the full width of the cogs. I’ve got an 11-30 cassette installed, but have ordered a NOS 12-32 which will be a better match for the 48/39 rings up front. 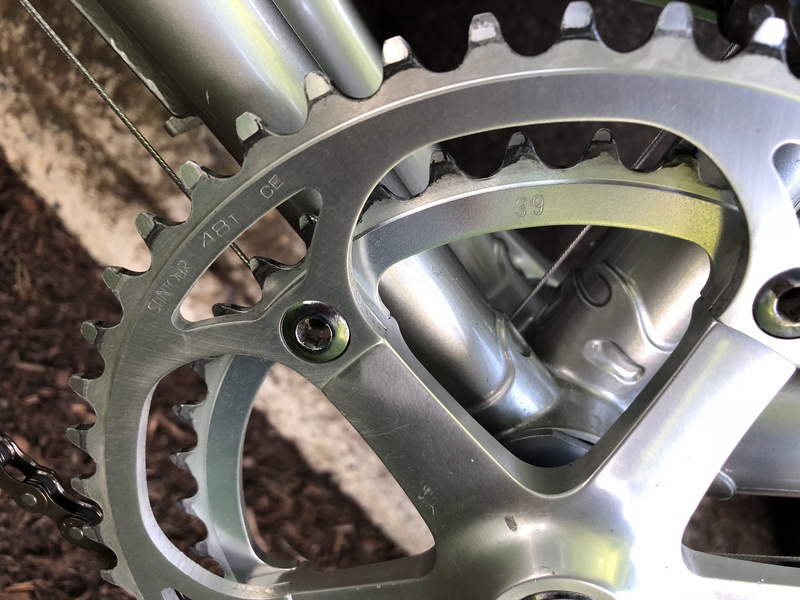 The SunTour Sprint crankset originally had a 40T small ring, but the frame clearance was questionable with the SunTour Sprint NOS BB I had installed. So, I swapped in a Sugino 39T ring. You can see that the clearance on the small ring is tight, but acceptable. 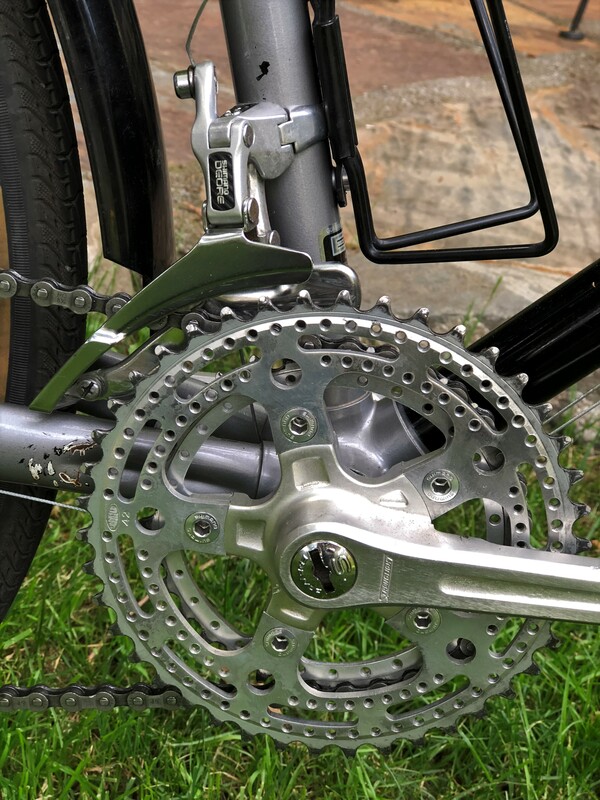 The chainline is perfect, and shifting both front and rear is crisp and reliable. The saddle and seatpost choices were more involved. I knew I would want a no-set-back seat post, given the Appy’s long top tube. So, I selected a Thomson, a brand which I had used before. It’s very easy to micro-adjust the horizontal angle on these seatposts. 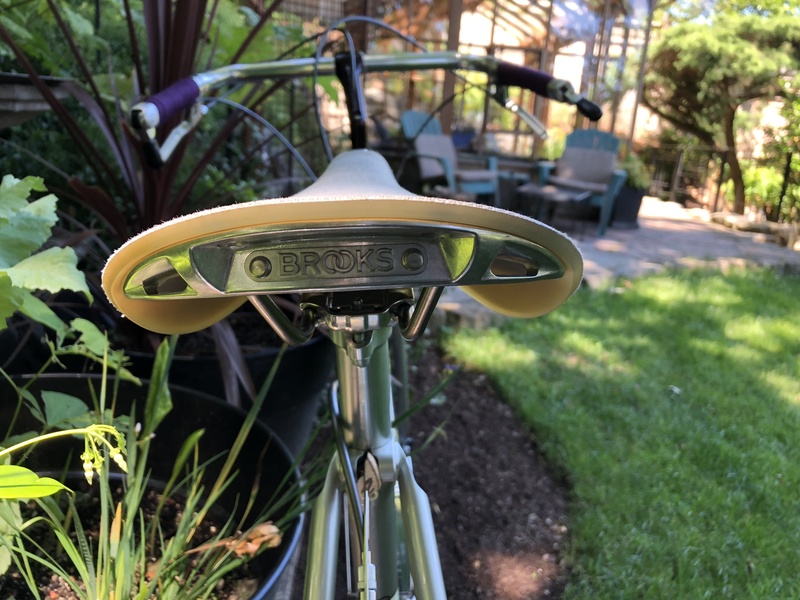 What’s a Rivendell without a Brooks leather saddle? 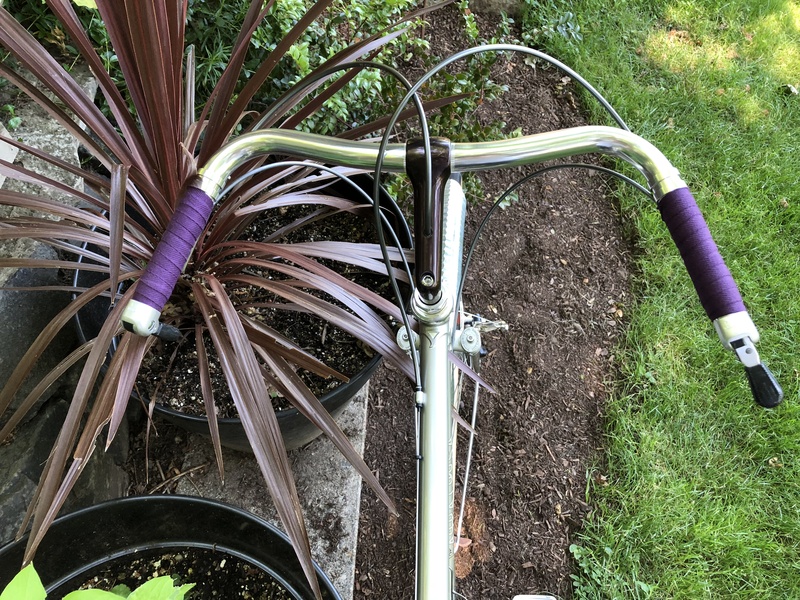 But before I opted for a leather saddle, I decided to try out the Brooks Cambium Saddle, a non-leather option whose color scheme looked perfect for this bike’s paint scheme. Wow! 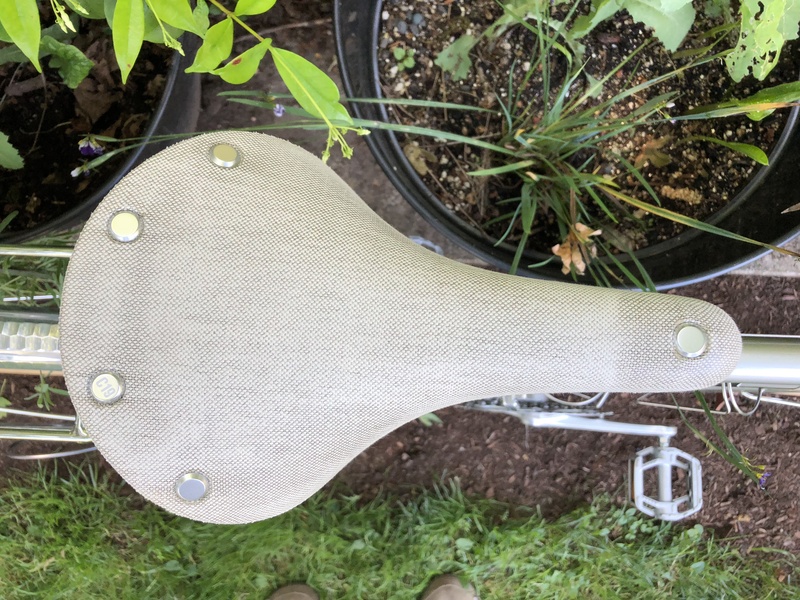 While it’s probably not right to use the words comfort and saddle in the same sentence, this Cambium C19 saddle was far more comfortable on its first ride than any other saddle I have tried. For the braking system, I used SunTour’s XC Pro Cantilevers, with the “champagne” finish. While the brakes look beautiful, I doubt I would choose them again. Setting them up, with their internal springs, involves dialing in the spring tension on each brake arm using a 13 mm wrench. SunTour supplies this tool, but its shape is not optimal for this process. As a result, me and my 13 mm cone wrench have spent so much time together that I think we are in a relationship. 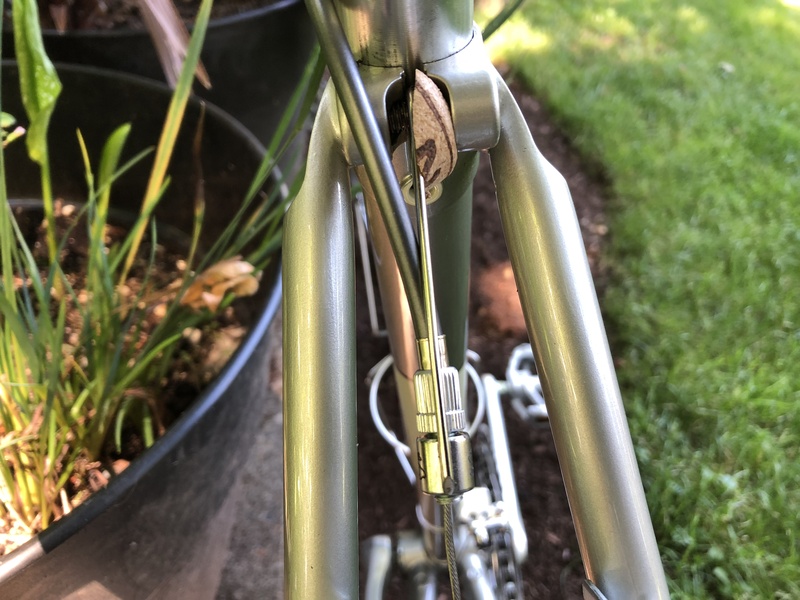 Sheldon Brown has some excellent advice regarding setting up this type of cantilever, but what I found is that fine tuning the spring tension requires a great deal of trial and error. For the brake cables, I decided to try Jagwire’s compressionless brake housing (try not to panic!) in an Ice Grey color which integrated well with the color scheme for this bike. The rear hanger was a problem. No hangers were supplied with the frame, as it is assumed that the build will include V-brakes (gasp!). 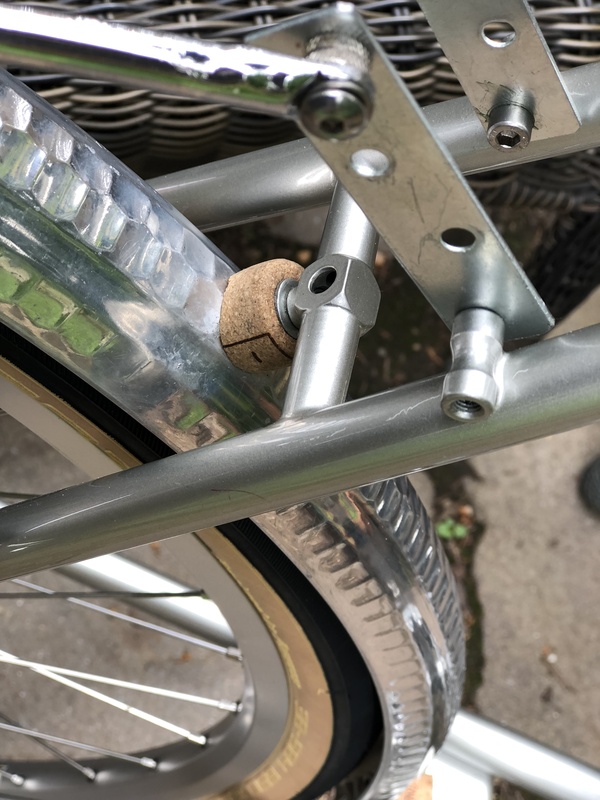 I used a Surly hanger, but it doesn’t work well with the Rivendell’s seatpost bolt, so I hastily added a wine cork wedge to help align the rear cable. 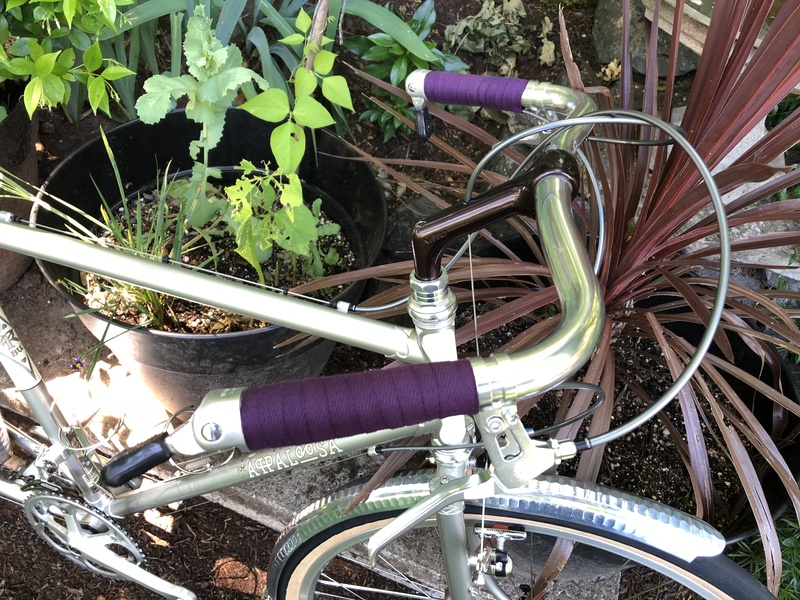 I also routed the front cables “french-style” over the top of the handlebars. I like it. The 650b wheelset consists of Velocity Atlas rims laced to Deore XT hubs. This is the wheelset recommended by Rivendell. I wanted to use 38mm 650b tires in order to make this tall bike a little lower to the ground, and because I had some 48 mm hammered aluminum fenders which would work well with this application. 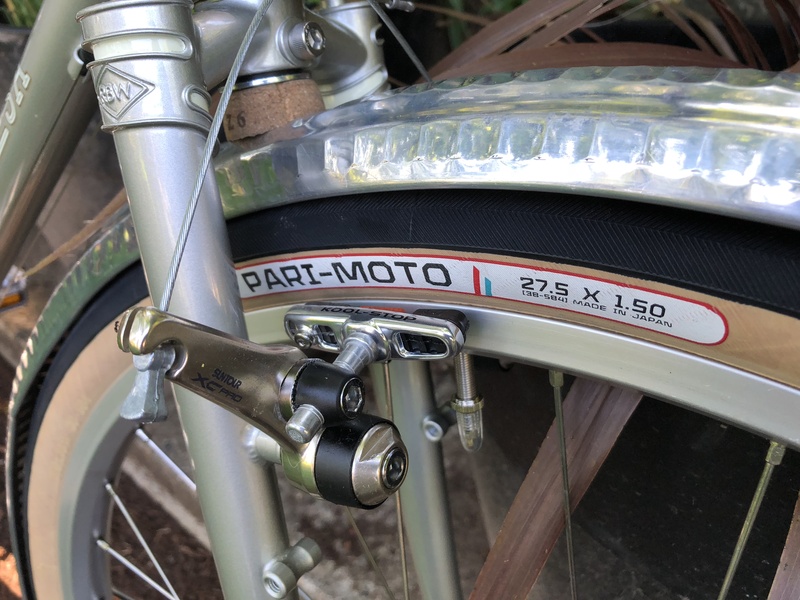 I hadn’t tried Pancenti’s Pari Moto tires before, so thought I would give them a shot for this build. They are very light, but difficult to mount. 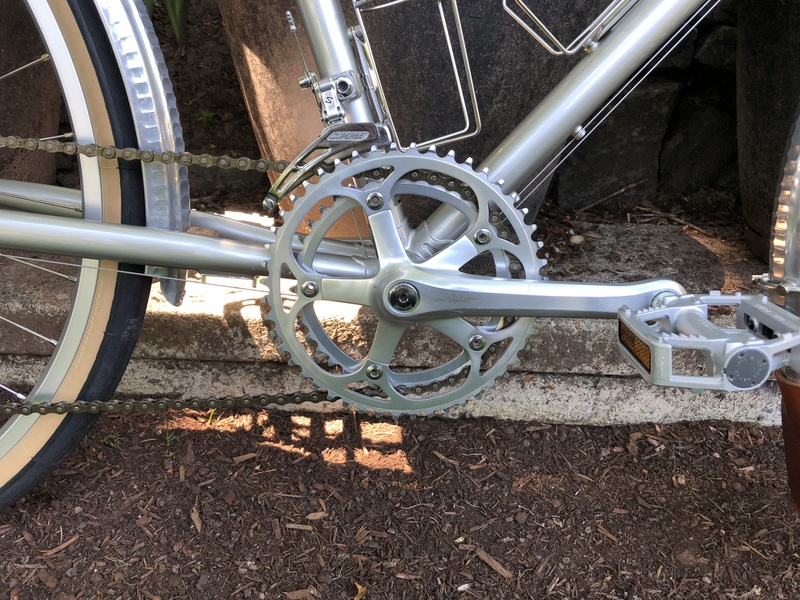 I haven’t ever had to use my truing stand to mount tires, but for the Pari-Motos this was necessary, as they would not seat evenly into my rims. That process took hours. But, out on the road, the tires provided a plush and comfortable ride. Speaking of being out on the road, I took the bike out today for its maiden voyage. 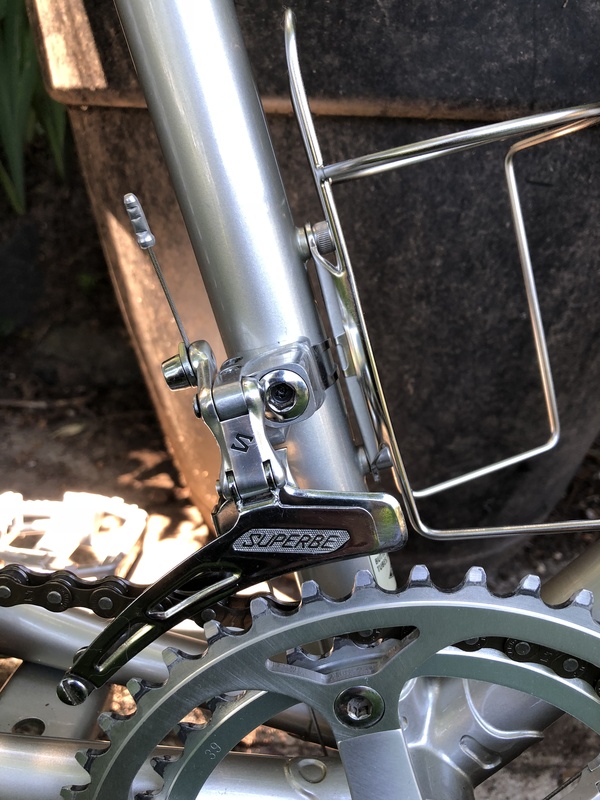 I knew I would have some issues to deal with regarding the Suntour cantilevers, but I wanted to also make a list of other tweaks, plus get a feel for this unusual bike with its slack angles and long wheel base. I did a short circuit from my home, which is in a hilly neighborhood. On the way back, there’s the “easier hill” and then there’s the harder hill which I don’t normally choose unless I’m feeling really robust. But today, on the Appaloosa, I returned home up the more difficult route. Even without really low gears, the bike responded well to steep inclines. 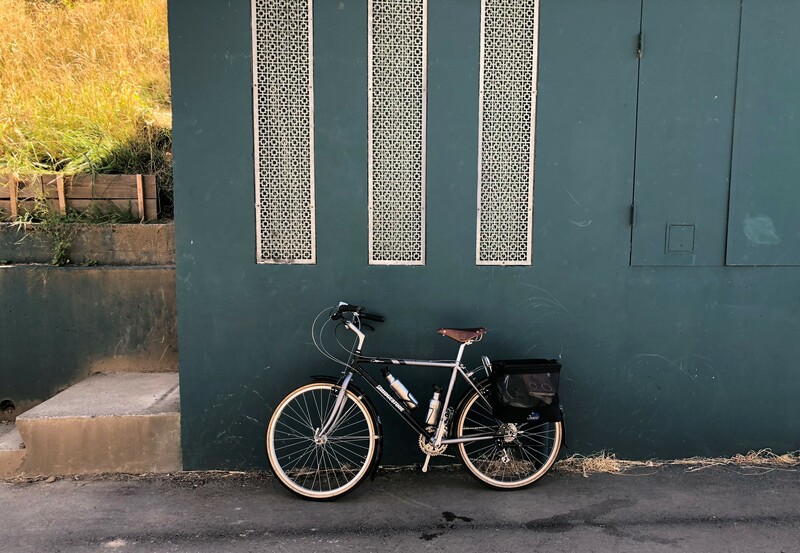 Riding the bike felt like driving my Dad’s old Northstar Cadillac – truly a stylish land yacht, but comfortable and offering plenty of performance. 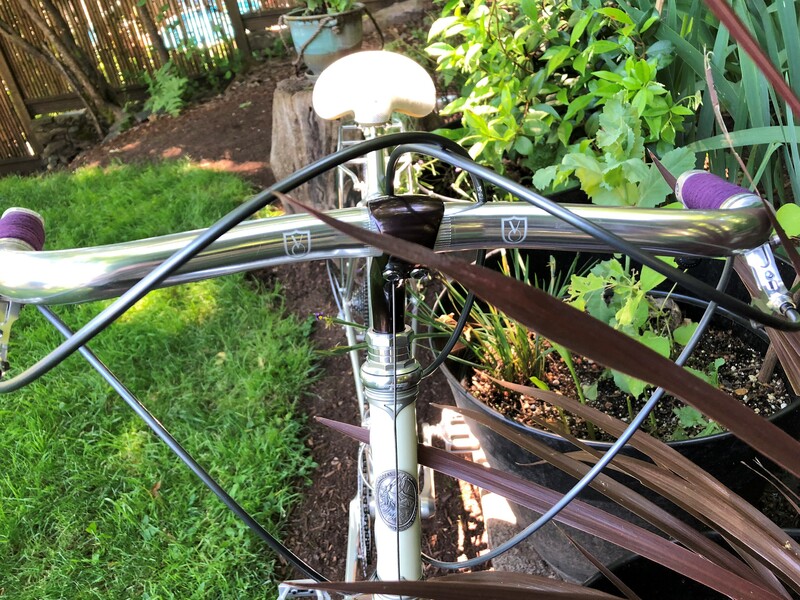 The V-O porteur bars offer several hand positions, which I took advantage of while climbing. I also used V-O’s Grand Cru levers, which seemed to integrate well with this build. The levers are really light weight, but do not have a return spring. Nonetheless, they were easy to set up, and offer a good feel while riding. 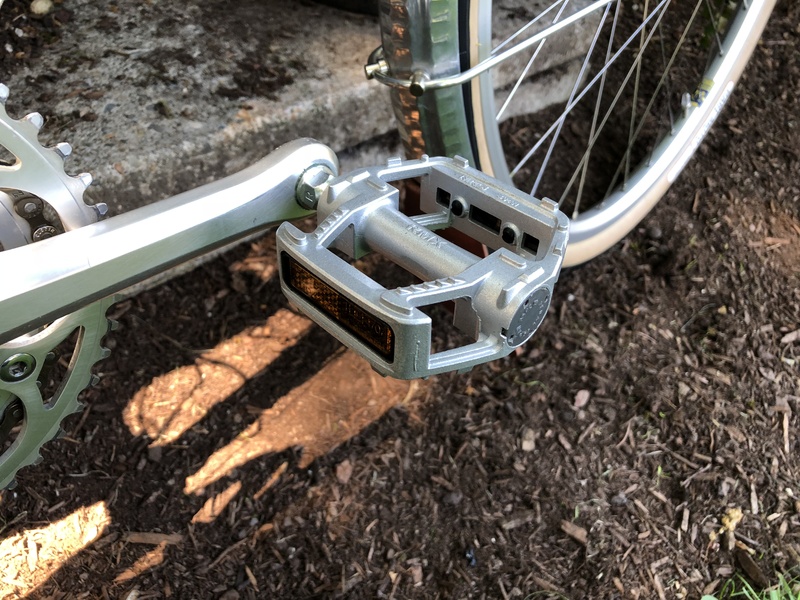 I also tried out these inexpensive MKS commuter pedals, which I pumped today with my summer sandals. They actually worked better than expected. 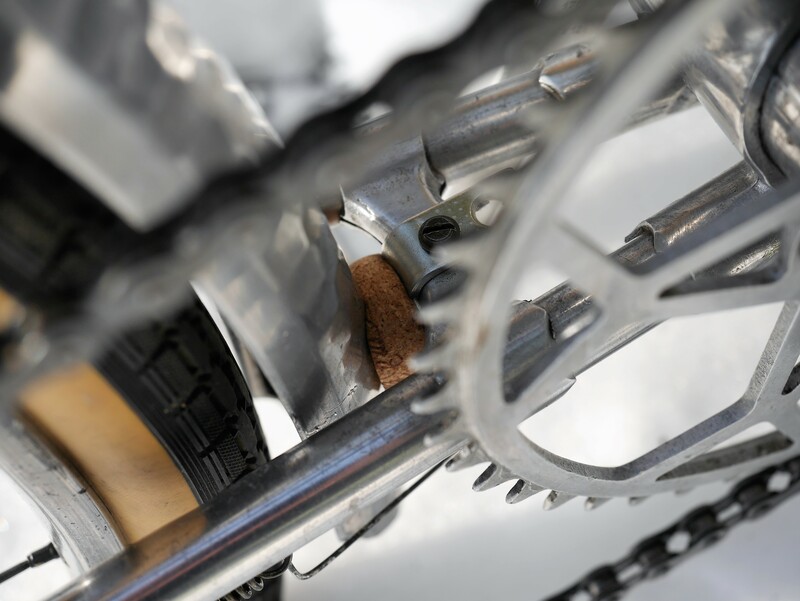 As with most MKS pedals, you will want to add grease and adjust the bearings. 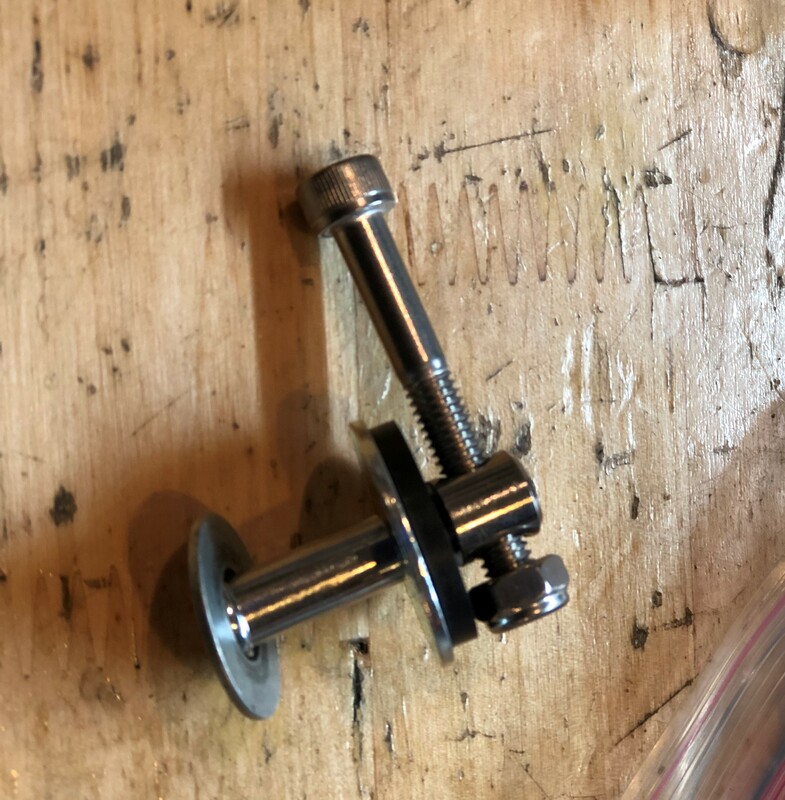 In my experience, MKS pedals are shipped dry and adjusted too tight. I was more cautious than usual about taking the bike out on its first test ride. I think partly because of its lovely frame which seems too beautiful to ride, and partly because of anxiety regarding the SunTour cantilevers. While the brakes are not in their ideal adjustment, they actually performed very well. The ergonomics turned out to be almost perfect, with just a few minor tweaks needed. As I got used to this bike, I found its natural cadence. Every bike has one. The Appaloosa’s is unhurried and strong. 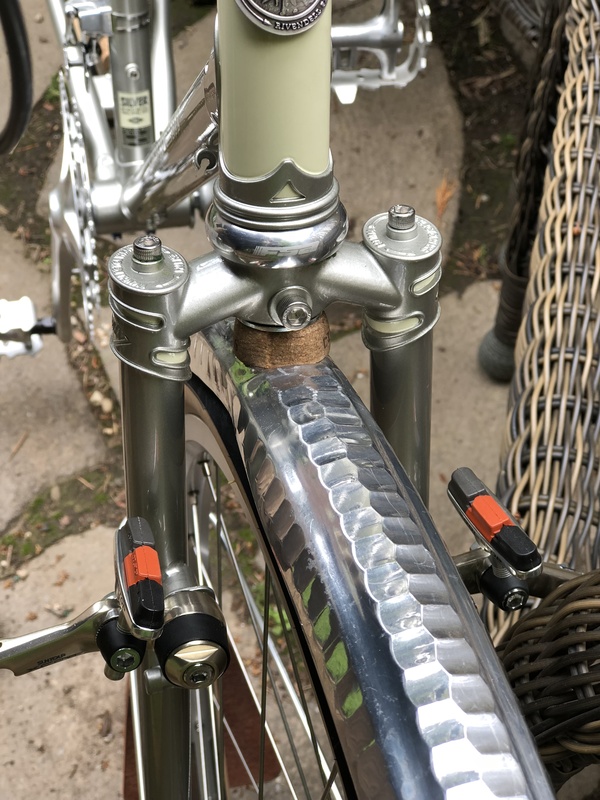 Installing rigid aluminum fenders is a process that differs more than you would think from the installation of plastic mudguards, whether they be of modern variety or vintage. 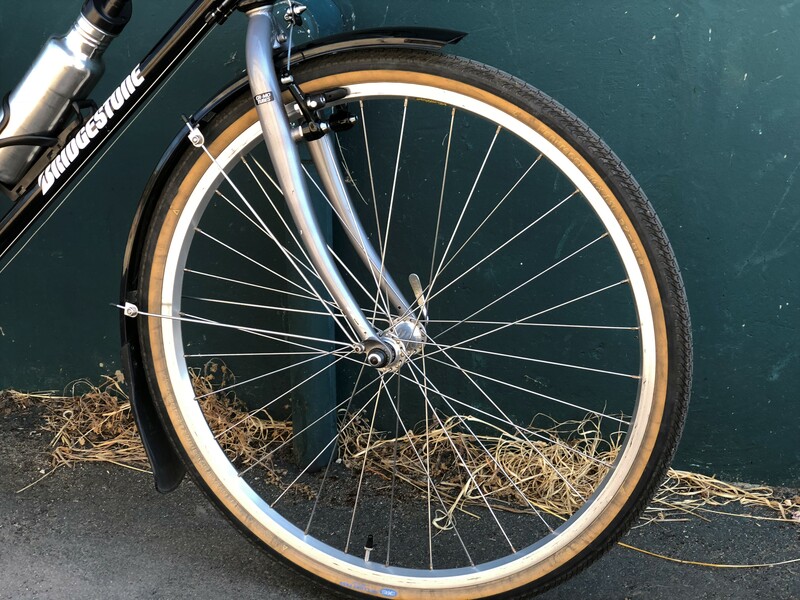 In fact, setting up fenders and racks can take more time than ALL of the other steps involved in making a bicycle mechanically sound and rideable, or building up a frame from scratch. There are only a few resources on the web that will help with this process, and one of them is from the Jitensha shop in San Francisco. The guidance at Jitensha is helpful to anyone setting up aluminum fenders. 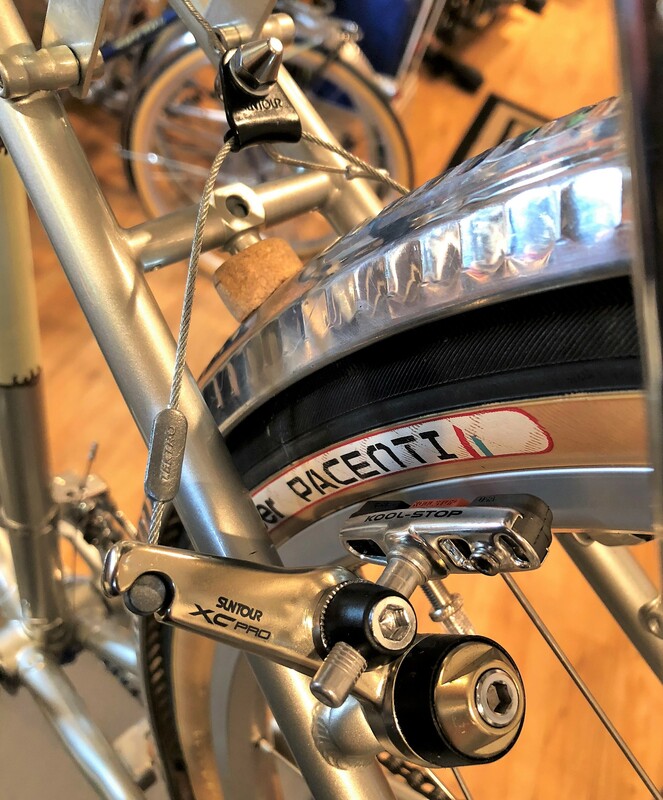 While Jitensha’s advice deals specifically with Honjo fenders, it translates across most other aluminum fender installations. In addition to the other tools you might need (drill, punch, hacksaw or dremel, and file), a deburring tool shown above is also helpful. You’ll also need stays and a set of fender hardware, plus you’ll need to consume a few bottles of Belgian Ale or Champagne (see below). Yes, this is a very difficult task. 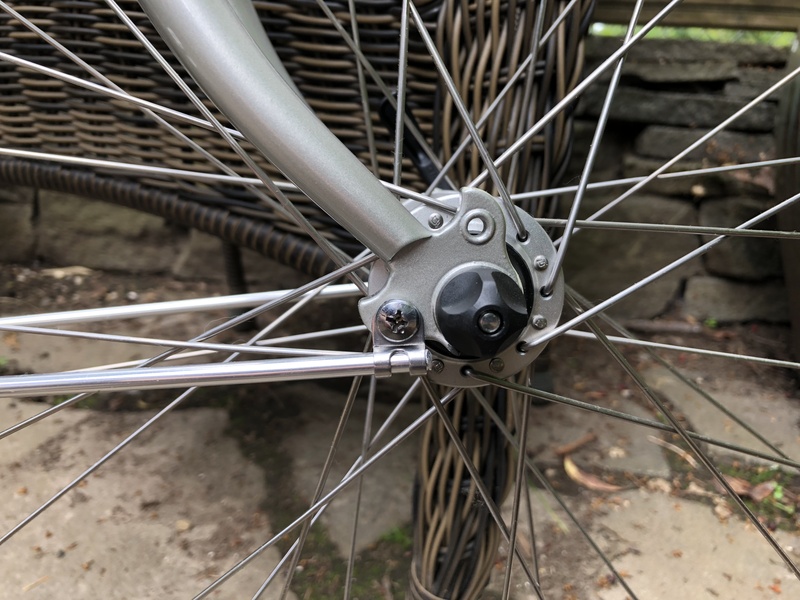 If you are working on a bike with newer dropouts, they may not be designed to allow for the fender stays to clear the wheel axle nut. The eyelets on the dropouts shown above are from my new Rivendell Appaloosa frame. 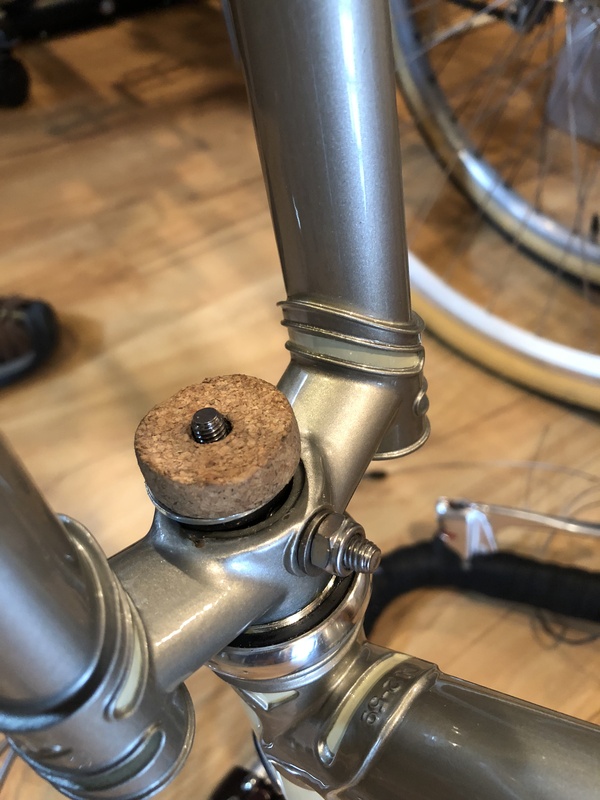 While these eyelets look robust, and it is nice to have two on the front and the rear, their position is in stark contrast to dropout eyelets on vintage bicycles, as you can see from the example below. 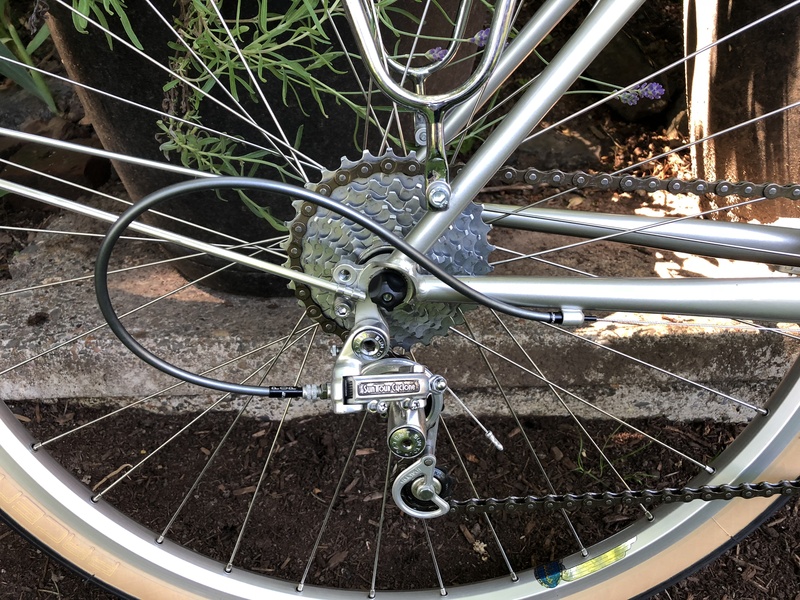 Properly positioned dropout eyelets allow the fender stays to clear the frame, thus making set up of the fenders much easier. 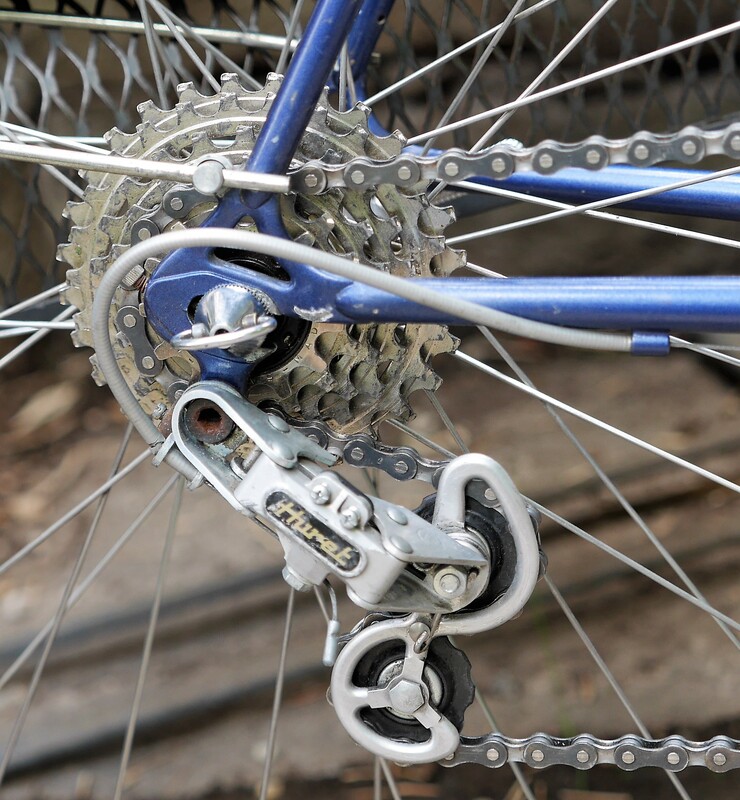 Such eyelets allow the rider to change tire widths without having to replace the stays. 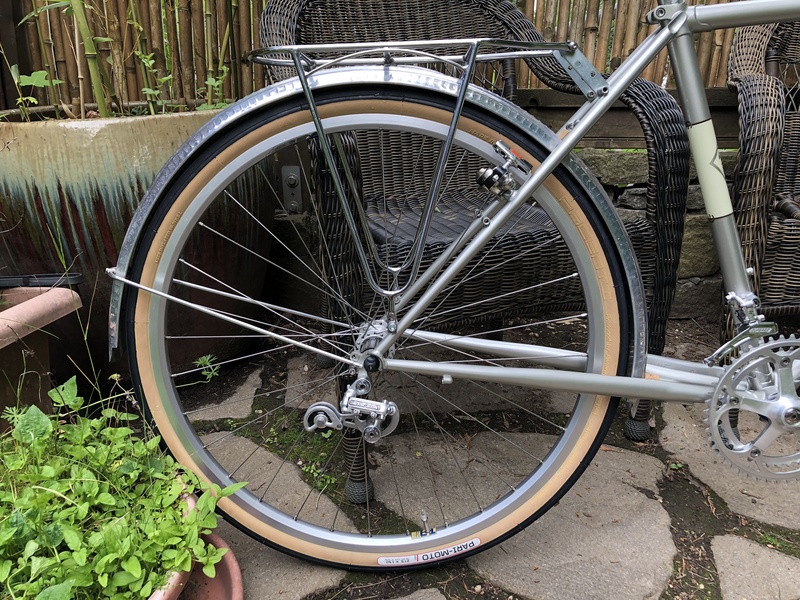 In the case of my new Rivendell, it was necessary to cut the stays to the exact length necessary to accommodate the tire size I’ve chosen for this bike. That means that if I want to change tire width, I’ll have to install a new set of stays. That is just one example of the difference between modern plastic fenders and their aluminum counterparts. 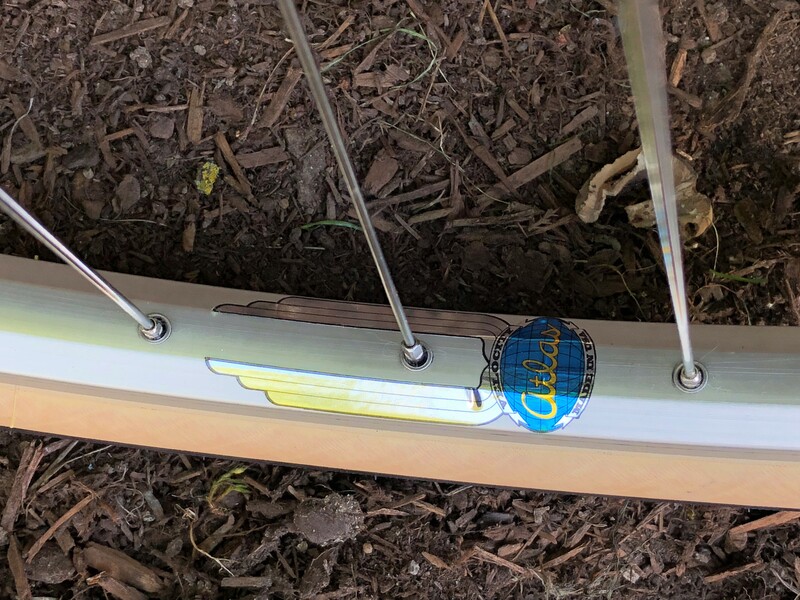 Plastic fenders have the stay adjustment at the fender, and not at the dropout. Plenty of room for a large cork spacer. 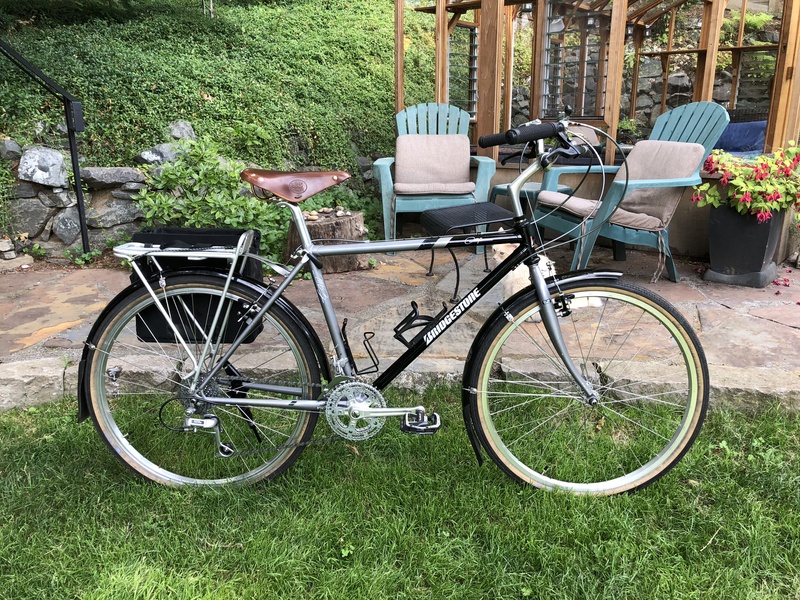 My Rivendell is the rare bike with HUGE clearances front and rear. I will be using 38 mm tires for my build on this bike frame (which can accept up to 55 mm tires). That means that my fender line is going to need some large spacers (of the Champagne and Belgian Ale cork variety – life is hard!). 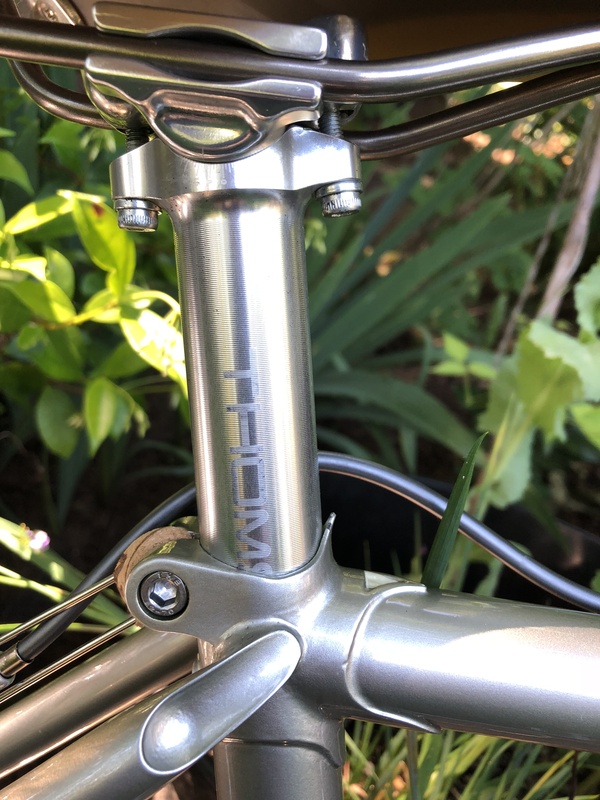 Even on a bike with regular clearances the front fender daruma bolt is often too short to provide the length needed for the width of the spacer at the fork crown. 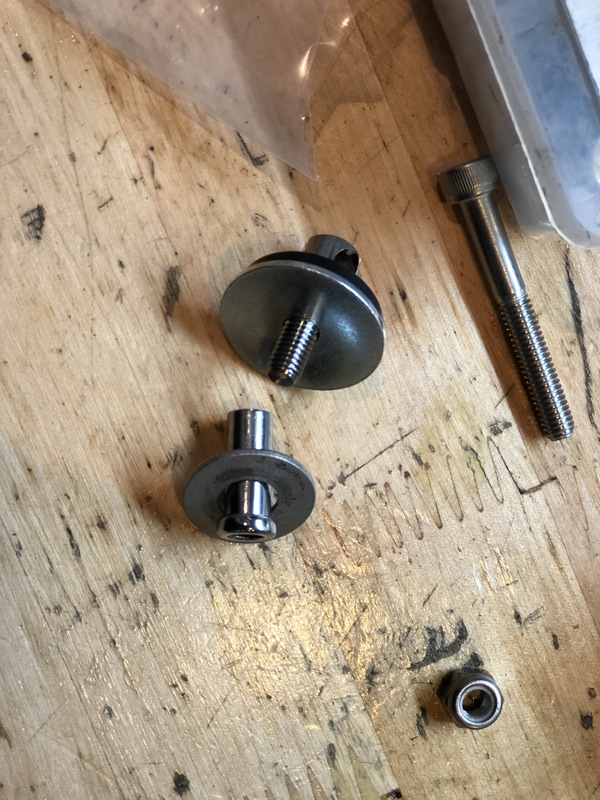 The solution is to use a recessed brake nut to extend the length of the daruma bolt. The photos above show how this works. For the front fender installation, it is easiest to turn the bike upside down. You can see from the photo above that the cork spacer consumes almost the full length of the daruma bolt. That’s where the recessed brake nut comes in handy. The champagne cork spacer is shown above, as installed. The extra width helps to set up a proper front fender line for my chosen 38mm tire size. 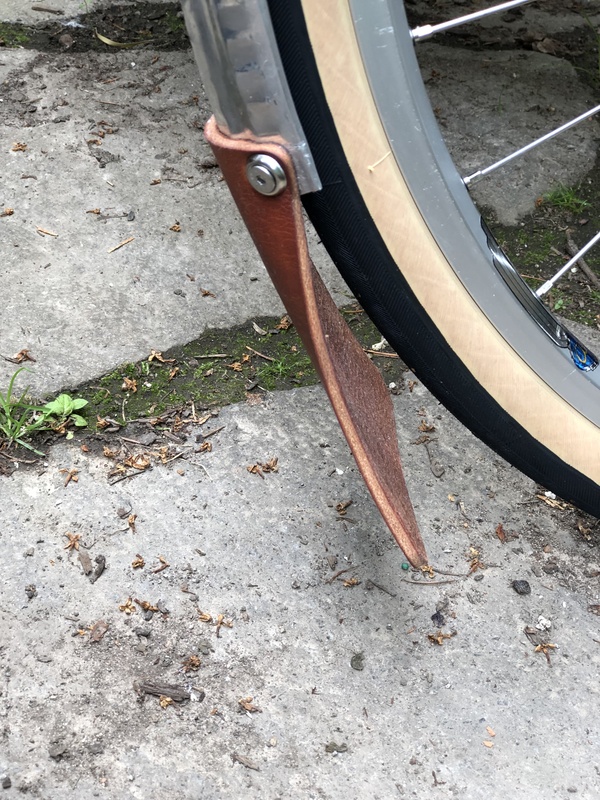 I also used a Velo Orange leather flap on the front fender, as shown above. The flap sits low to the ground and will help to keep debris off my frame and bottom bracket. Rear fender line in excellent shape, thanks to the cork spacers. 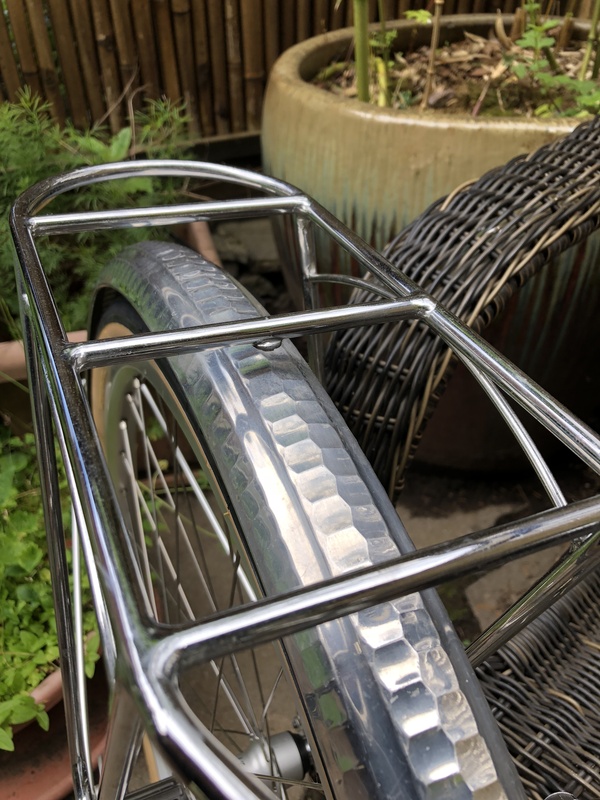 Porteur rack has fender attachment – a nice feature. With the front fender now properly spaced, the rear fender set up proved easier. 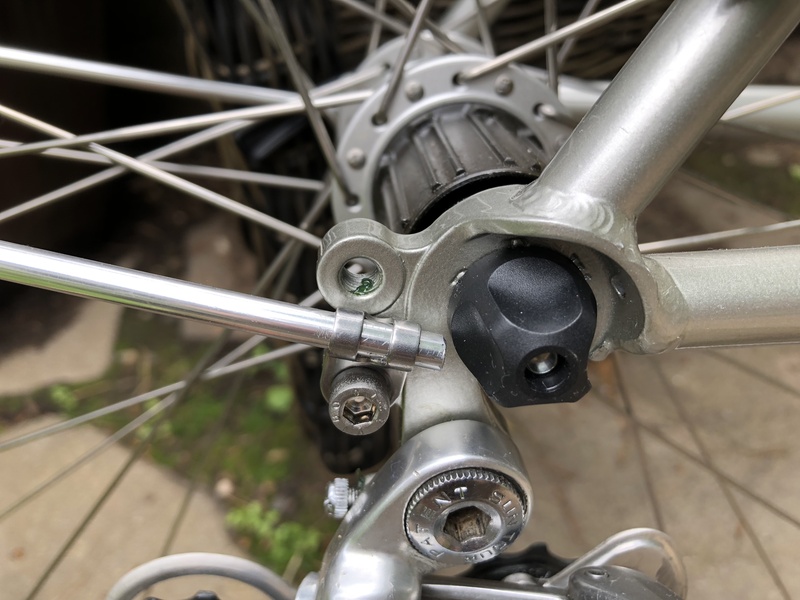 Again, because of the positioning of the eyelets on the dropouts, it was necessary to cut the stays to the exact length needed for my 38 mm tires. 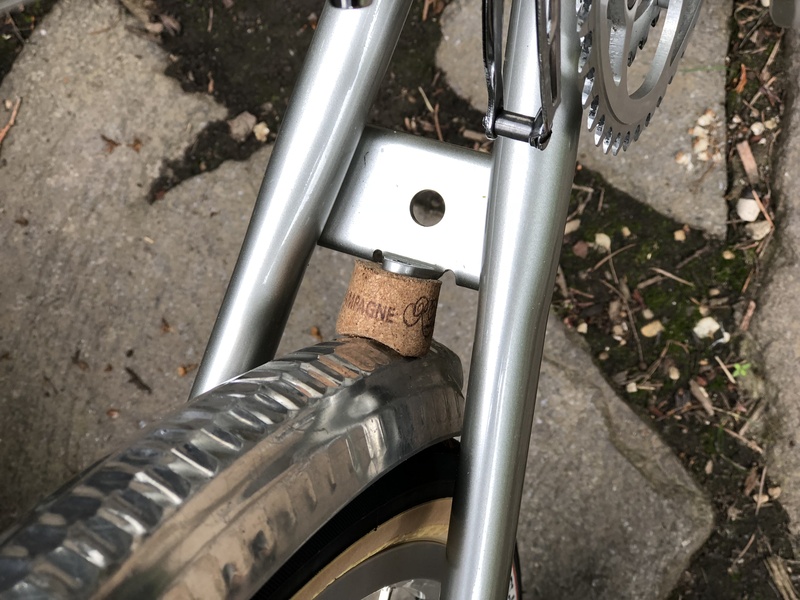 Champagne or Belgium Ale corks respond well to a metal file, so they can be shaped to follow the curve of the fender. 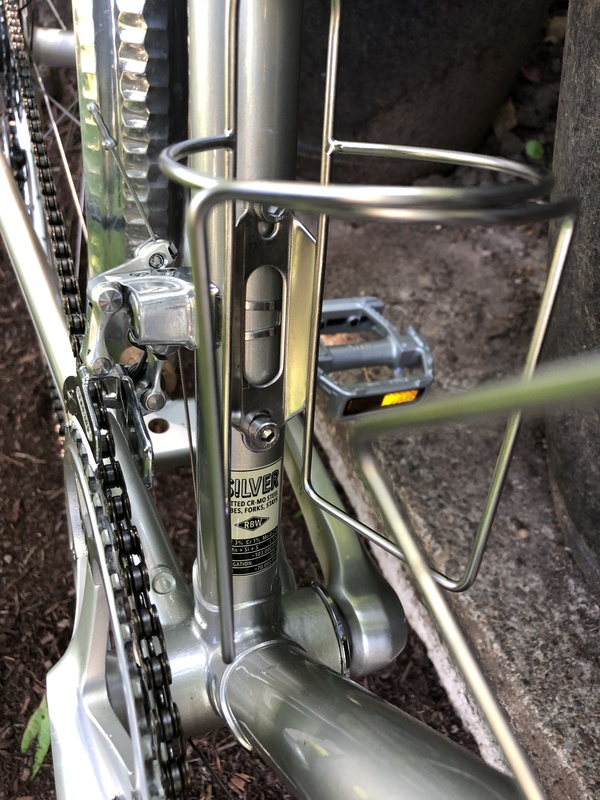 My porteur style rack allows for a fender attachment, as shown above. I’ll wait to set that up until I’ve test-ridden the bike and adjusted all of the accessories and components. Meanwhile, I’m going to enjoy a glass of Champagne!